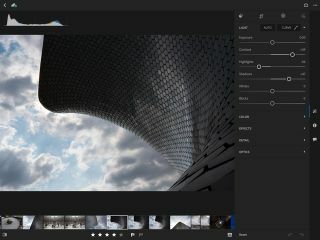 Adobe has announced a major update to its Lightroom Mobile app. The update is available for users of its iOS and Android versions, although the changes made to each platform are different. Android users gain a new interface that's been designed "from the ground up" to be faster and more efficient. Every screen is said to have been redesigned, the result being a more natural experience for Android users. iOS users, meanwhile, gain a wealth of new features, the main one being a new Selective brush (below). This, Adobe claims, has been added due to popular demand, and allows users to paint enhancements directly onto specific areas of an image. Furthermore, iOS users with models that support Apple's 3D Touch feature can also vary the strength of the effect by simply pressing harder or softer on the display. Global adjustment to both sharpening and noise reduction are also now possible through a new Details tab (below). Other changes to the iOS version include the ability to selectively erase linear and radial gradients, while iPad users will also benefit from a revised interface. The app, which was first launched for iOS users three years ago, sits alongside the popular Lightroom CC desktop version of the program. This, together with its Camera Raw software, have also both been updated today, with support now provided for the latest DSLRs such as the Canon EOS 6D Mark II and the Nikon D7500 heading a list of other changes.